The City and Guilds Certification in Fundamental Inspection, Testing and Initial Verification 2392-10 electrical training course London has been designed to give candidates the necessary skills for practical inspection and testing of newly installed electrical circuits. Topics covered include: practical and theory relating to the inspection and testing of new fixed wiring electrical installations, safe working and isolation practices, use of test equipment, and associated inspection and testing documentation. This City and Guilds electrical training course will be assessed by an online 50-question examination, as well as a practical assessment which lasts around two hours. Successful completion of the 2392-10 electrical course requires a pass in both theory and practical assessments. Both online and practical sections must be passed to receive City and Guilds Certification. Successful candidates will achieve a City and Guilds Certification in Fundamental Inspection, Testing and Initial Verification 2392-10 certificate. The length of the course is five days between the hours of 9am-5pm and takes place at our specialist Watford training centre, in Hertfordshire just north of London. 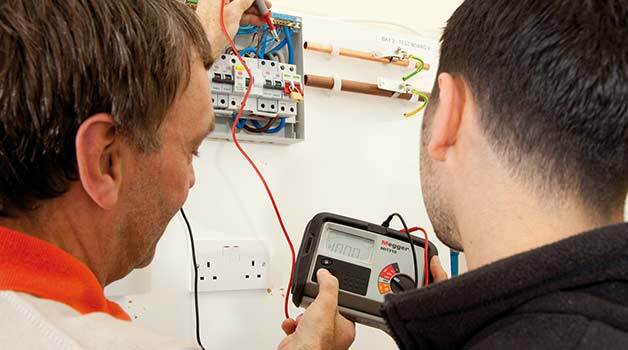 The City and Guilds electrical training course in Teesside is suitable for delegates who want to carry out electrical inspection, testing and certification of domestic electrical installations. It has been designed for electricians with existing electrical knowledge and those who have been working in the industry but have no formal qualifications or hold the 17th edition, 2382 or Part P qualification. In recent years the 2391-10 electrical training course suffered from high failure rates due to its intensive nature. Therefore, City and Guilds introduced the 2392 to allow people to carry out inspection and testing in only low voltage single phase domestic applications. If you wish to undertake inspection and testing in industrial, commercial, or 415v / 3 phase applications then you should also complete the 2391-10 electrical training course. Candidates who successfully pass the City and Guilds Certification in Fundamental Inspection, Testing and Initial Verification – 2392-10 electrical training course, combined with the Part P qualification are able to certify their own installation work and will also be well positioned to move on to the City & Guilds Inspection of Electrical Installations – 2391-10 electrical training course. This electrical course is a stepping stone to the City and Guilds 2391-10 which is a more in-depth inspection and testing course. Individuals with a basic level of experience in inspection and testing of electrical installations would also benefit from this course. There are no formal entry requirements for anyone undertaking this qualification. However, to pass this course candidates are expected to have extremely good electrical knowledge or at least 12 months experience in electrical installation work. The course is not approved for persons under the age of 18. Candidates on this London electrical training course are required to bring with them a current copy of BS 7671 2008 – IEE 17th Edition Wiring Regulation and a copy of Guidance Note 3. This City and Guilds 2392-10 level 2 Inspection, testing and verification of electrical installations is held in Watford, near London, and is an ideal step for domestic installers with no formal qualifications to be able to verify (not certify) their own installations.